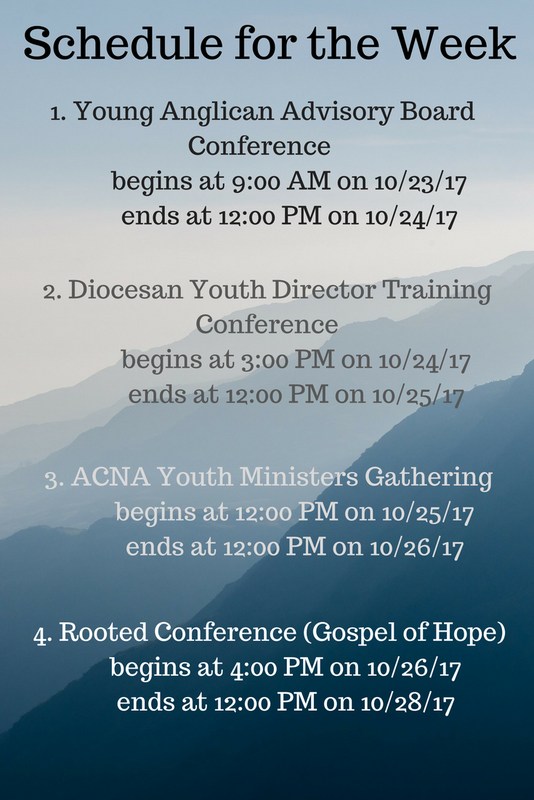 We will discuss how to train and coach professional and volunteer youth leaders, to support excellent youth ministry in the ACNA by networking youth leaders and adolescents, to provide resources to make church youth ministry prosper, and to advocate for ministry to adolescents at the parish, diocesan and provincial level. *Please note that housing (2 per room), food, and the Young Anglicans Advisory Board Summit are completely covered and free of charge. You are responsible for making your room reservation. Please make and pay for your reservation here for the nights of October 22, 2017 and October 23, 2017. We will reimburse you at the rate of 2 people per room.